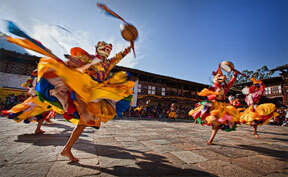 Bhutan’s chronicled history begins with the advent of Buddhism in the 8th century. It is said that in 747 A.D. the Buddhist saint, Padmasambhava, popularly revered in Bhutan as Guru Rinpoche or the Precious Master, visited the country and introduced Buddhism. In the 17th century, Zhabdrung Ngawang Namgyal (1594-1652), a leader of the Drukpa Kargyu school of Buddhism, consolidated the country and established the Chhoesi or dual system of government, whereby both the temporal and religious authority were separated and vested in the Druk Desi and Je Khenpo respectively. By the end of the 17th century, the country emerged with a distinct national and cultural identity as well as an unprecedented degree of political stability. By the second half of the 18th century, the country witnessed a resurgence of political instability. The external threats in the latter half of the 19th century added a new dimension to the political quandary. It was against this background that the need for strong national leadership emerged. Peace and stability was restored with the enthronement of His Majesty King Ugyen Wangchuck as the first hereditary monarch of the kingdom in 1907. The establishment of the monarchy ushered in a new era of peace and stability and most significantly unified the country under a central authority. It also set in motion a steady process of engagement with the outside world and laid the foundations for the country as a modern nation state. The third King, His Majesty Jigme Dorji Wangchuck instituted far-reaching political, social and economic reforms. He instituted the National Assembly, the High Court, and the Royal Advisory Council. He started the planned development process in 1961. He also guided Bhutan to membership in the UN in 1971. Since his coronation in 1974, His Majesty Jigme Singye Wangchuck, the fourth King, has dedicated himself to defining and realizing a long-term vision and direction for the country. He promoted an approach of development known as Gross National Happiness (GNH) which calls for a careful balance between creation of material wealth and the spiritual, cultural and social needs of the society. He also pursued a process of democratization and involvement of the people in their own affairs from the national to the community level. On 14 December 2006, His Majesty Jigme Singye Wangchuck voluntarily abdicated the throne and handed over the responsibilities of the Monarch and the Head of State to the Crown Prince His Royal Highness Jigme Khesar Namgyel Wangchuck who has since assumed responsibilities as the Fifth King of Bhutan. His Majesty the King Jigme Khesar Namgyel Wangchuck was adorned with the Raven Crown at an ornate coronation ceremony in Thimphu on 6 November 2008, becoming the world’s youngest reigning monarch and head of the newest democracy.